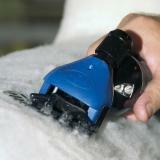 Requires only one screwdriver and just 3 minutes to switch from a clipper head to a shear head. Need replacement parts? See "Replacement Parts Tab" below. 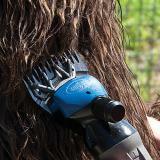 Shear heads are used for general flock shearing and for blocking show sheep, shearing llamas and alpacas. On cattle it can body clip, block show cattle or "peel" sale cattle effortlessly. Some folks have also used it to shear guard dogs so that they stay cool in the summer. Tension column far superior in design, less small/individual parts to wear out. Need replacement parts? See "Replacement Parts Tab" above. 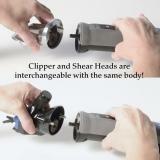 Interchangeable shear head fits onto same motor as our clipping machine. Less 'down' time when changing combs and cutters. Runs cooler. See instructions above for installation, tensioning and oiling instructions. Warning: Unlike some other clipper motors, this motor will neither slow down nor sound different when oil is needed. But failure to oil will quickly cause damage to the blades and drive head. So you MUST apply oil by time instead of sound. Apply a small amount of oil every 3 minutes to the tips of the teeth and each side of the blade by dipping them into a dish of oil or pouring oil directly onto the teeth with a small oil container and every 10 minutes drip oil into the small hole behind the tension knob assembly. Excessive wear can occur if not oiled properly! 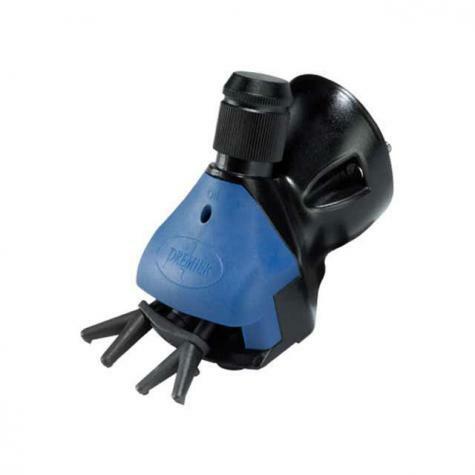 Drives either Premier's shear head or clipping head. Powerful permanent magnet motor with high torque.